Today is the 41st anniversary of the 1970 National Guard killings of Vietnam War protesters at Kent State University. The enhanced audio tape released in 2007 provided evidence the Guards were ordered to shoot. There are a lot of articles this weekend on the enhancement of a 1970 Kent State shooting audio recording, reporting new analysis provides evidence the Guards were ordered to shoot. "Guard!" says a male voice on the recording, which two forensic audio experts enhanced and evaluated at the request of The Plain Dealer. Several seconds pass. Then, "All right, prepare to fire!" "Get down!" someone shouts urgently, presumably in the crowd. Finally, "Guard! . . . " followed two seconds later by a long, booming volley of gunshots. The entire spoken sequence lasts 17 seconds. 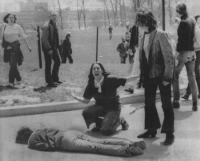 An audio recording of the shootings 40 years ago at Kent State University includes the voices of Ohio National Guard leaders ordering troops to fire into a crowd of students, according to a man wounded in the shootings, who obtained a copy of the recording. Bump and Update: You can listen to the tape here. May 4 marks the 37th anniversary of the shooting deaths of students at Kent State University. I write about it every year. This year, there is news, and one of those injured in the shootings says he has new taped evidence to show there was an order given to open fire. Alan Canfora, who was wounded in the right wrist during the 1970 anti-war protest, said he recently requested a government copy of the nearly 30-minute tape stored in the Yale University archive. Just before a 13-second barrage of gunfire, a voice on the tape yells, "Right here! Get Set! Point! Fire!" Canfora said. The tape will be released at a news conference tomorrow.